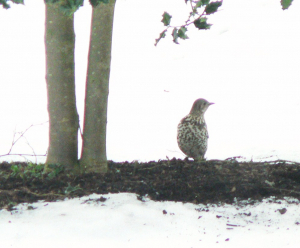 Observation - Mistle thrush - UK and Ireland. Description: A pair of thrushes feeding under a holly bush. Difficult to see full colour clearly. A pair of thrushes feeding under a holly bush. Difficult to see full colour clearly.